The colonial house at 114 Colonial Road sits on a 2.46-acre level property within walking distance of the 10-acre Browne Wildlife Sanctuary, managed by the New Canaan Land Trust. NEW CANAAN — Perched on a plateau high above Valley Road is a quiet neighborhood of about a dozen houses on Colonial Road; its location giving residents — including those at 114 Colonial Road, access to divergent worlds. One is a “peaceful haven,” according to the co-listing agents, and the other is the benefit of proximity to two neighboring communities and their amenities. Down the street from this colonial house is the 10-acre Browne Wildlife Sanctuary, managed by the New Canaan Land Trust, and across the street from the house is the access to walking trails into that protected space. “The trail offers a raised walkway across a wetland, slight elevation changes, a view of the reservoir and a large glacial erratic rock that sits at a far corner of the property,” according to the land trust website. “Ongoing conservation efforts look to … maintain open trails for use by neighbors and the broader community … There are several natural and constructed features identified along the trail, including plant identification, geological points of note, and stone walls,” the website says. 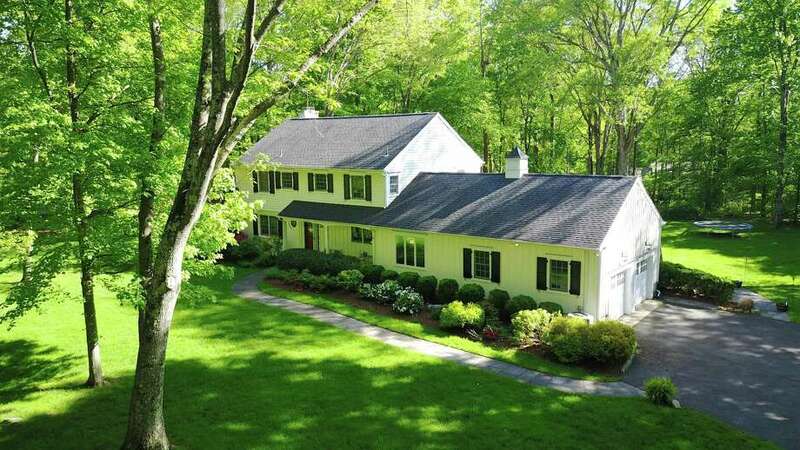 While the 2.46-acre level and sunny property on which this house sits is some distance from the center of town it is only a 10-minute ride to the New Canaan train station and only a 14-minute trip into the center of Wilton. The 4,259-foot house was built in 1956 and over the last 19 years it has received many upgrades and improvements that almost equal the asking price of the home. Those many improvements in recent years include an update of the kitchen, extensive renovation of the family room, a remodel of the master bathroom, installation of a home audio-video system (indoor and outdoor), and a new Control4 system. In 2010 all the original windows were replaced including the bow window in the formal living room, and a new boiler/furnace was installed. The clapboard and board and batten house is set well back from the road behind a number of tall trees and landscaping that includes flowering shrubbery. A slate path leads from the driveway to the covered front porch. The front door is framed by sidelights and opens a sizable foyer, off of which is an office or library with a wall of floor-to-ceiling bookshelves. The living room has a red brick fireplace. The formal dining room is not enclosed. It is completely open to the living room. Take one step up from the living to the dining room, which has two separate multi-paned doors to the spacious raised wood deck. In the sizable eat-in kitchen there is a hardwood floor, granite counters, a pantry, lacquer-painted cabinets, and a peninsular counter that creates a breakfast bar for two or three. There is a built-in desk area in the breakfast room. Behind the breakfast room there is a full bath. This main living level also has a half bath. The family room features a floor-to-ceiling stone fireplace flanked by built-in shelving and cabinets, a vaulted ceiling, two skylights and a ceiling fan. On the second floor there are four bedrooms. The master suite has a ceiling fan, dressing room, and marble bath with a large shower that has multiple rain heads and a hand-held wand. The full finished basement has wall-to-wall carpeting and lots of space offering flexible use as a media room, game or play room, and it has a nook that could be used as a second office, if necessary.